Paso Robles Library parking lot on the corner of Spring and 10th. The bus will depart promptly at 7:30 am. We estimate our return time to be 5:30 pm. 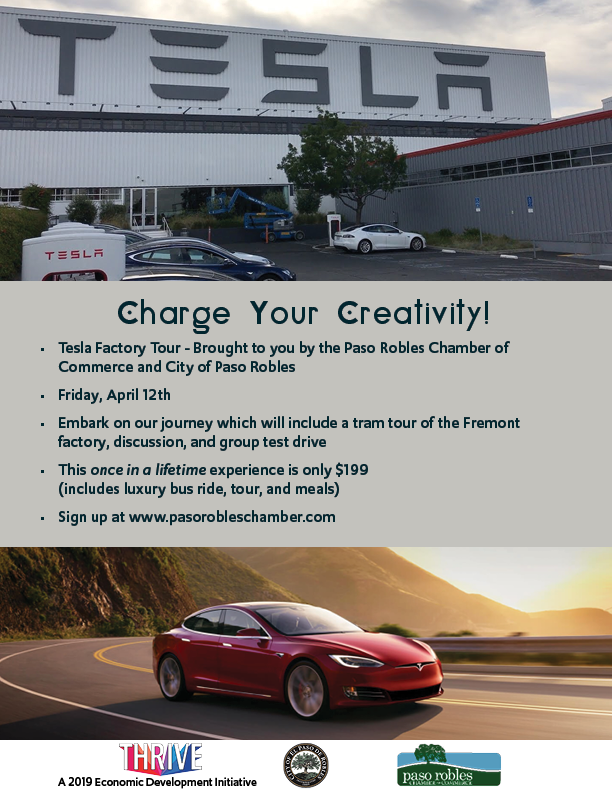 The Paso Robles Chamber of Commerce and City of Paso Robles will embark on a journey to Tesla! Trip will include a tram tour of the Fremont factory, discussion about Tesla's vision for the future and a group test drive. This once-in-a-lifetime experience is just $199 and includes luxury transportation, tour, meals and snacks. Join the Paso Robles Chamber of Commerce as we travel by luxury bus from Paso Robles to Silicon Valley. This trip includes stops at Facebook, LinkedIn and BootUp Ventures. Travelers will learn how to capture and retain consumers from the brilliance of the Facebook and LinkedIn then experience the co-working site, BootUp Ventures, the future landscape of business.